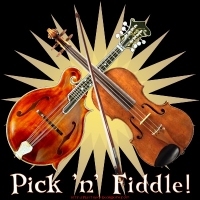 This “Pick ‘n’ Fiddle” design is for those multi-talented stringed instrument folks who can play both mandolin and violin, or those who just love both instruments. This design features an F-5 style mandolin with the fiddle, but if you prefer, there’s another similar design which has a bowlback or “taterbug” style mandolin instead! Find the perfect gift for your favorite picker & fiddler – maybe that’s you! – whether on a shirt or other apparel, or any of the merchandise it’s on.